Before World War II, these streets were thronged with Jews, who lived alongside Poles, Russians, Germans and Lithuanians in relative harmony. Ninety percent of Lithuania’s prewar Jewish population of 220,000 perished during the Holocaust. After the war, nearly half a century of Soviet rule took a further toll on Jewish culture. In the 1970’s, most of Lithuania’s Jews chose to immigrate to Israel or the West. Sofija Pavinskaite. Photo by Gintare Zakarauskaite. Today, Lithuania is home to only 4,000 Jews. 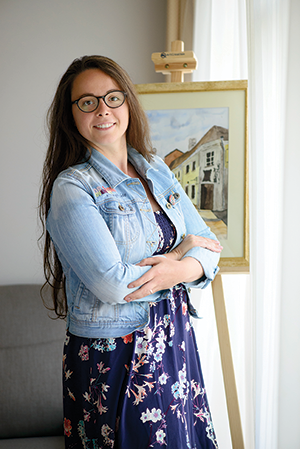 Yet Belaite and other women in Lithuania’s small Jewish community are working hard not only to preserve their Jewish heritage but to share it with members of the non-Jewish majority. Growing up, Belaite attended public school with only a handful of Jewish students and was conscious of being a member of a small minority. “I never hid that I was Jewish,” she said; her “strange” first name, brown eyes and dark hair made it obvious (most Lithuanians are fair). Back then, most of her friends were non-Jews and she dated non-Jewish boys. But when she finished high school and became a student of public health at Vilnius University, she began to strengthen her Jewish identity. At Jewish summer camp and community events, Belaite learned “the basics—prayers, the rules of kashrut, what to do on Shabbes and the holidays.” And when she discovered the Jewish students organization, she jumped at the chance to help it grow. Today, it has more than 600 members. “I want to help the community survive,” she said. Pavinskaite teaches art and history at the school, which was founded in 1989 during the waning days of the Soviet era and now has more than 300 students. It is directed by Misha Jakobas, the son of a Holocaust survivor who “knows all the students by name,” she said. Faina Kukliansky. Photo © Delfi/K. Cachovskio Nuotr. On Friday nights, Pavinskaite lights candles with her mother. On holidays, she attends the Choral Synagogue, which has been holding services since the 1990’s. It is the only active synagogue out of a previous 100 in the city. She also coaches swim teams for the local branch of Maccabi, the international Jewish sports league, and helps run a Jewish summer camp. Both Belaite and Pavinskaite are regulars at events sponsored by the Jewish Community of Lithuania, which has branches in seven cities, including Kaunas, Siauliai and Panevezys (traditionally known to Jews as Kovne, Shavl and Ponevezh). 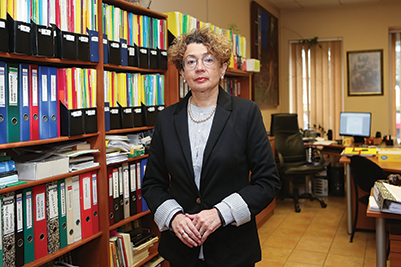 Faina Kukliansky, 61, was elected chair of the Jewish community in 2013. In that capacity, she manages a wide range of social services, clubs and cultural programs for all ages, from retirees who remember the days when Vilnius was the capital of Yiddishland to preschoolers experiencing their first taste of challah. 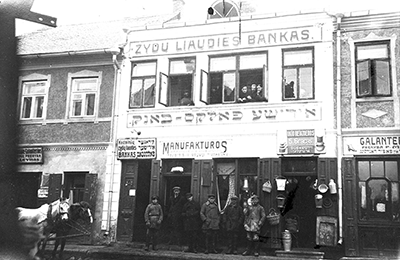 The Jewish Volksbank building in 1923. Photo by Joseph Marcus/Courtesy of the American Jewish Joint Distribution Committee. “It is thrilling to be heirs to such a magnificent,world-famous Jewish community,” she said, “and to be able to walk the streets in the footsteps of one of the most creative Jewish communities” of the past. Among Kukliansky’s initiatives is Bagel Shop, located in the Jewish community building on Vilnius’s bustling Pylimo Gatve. Staffed by young Lithuanians who are seeking to deepen their engagement with their country’s Jewish heritage, it offers educational programs, a newsletter—and bagels. Each year, Bagel Shop holds an awards ceremony to honor artists, educators and activists who advance the cause of tolerance in Lithuania. In 2015, Belaite was among the winners. Observers have measured increased anti-Semitic incidents throughout Europe, yet these women do not perceive a worsening atmosphere in Lithuania. “I don’t feel that in my surroundings,” Pavinskaite said. Belaite agrees. “I’ve never been mistreated because I’m Jewish,” she said. Alongside local programs like Bagel Shop and Belaite’s walking tour, Lithuania’s government has acted to support Jewish remembrance. The government has won praise for allocating $50 million in restitution funds to compensate the community for its losses in the Shoah. Public schools are required to teach about the Holocaust, and high schools are encouraged to join a network of 100 tolerance centers run by the International Commission for the Evaluation of the Crimes of the Nazi and Soviet Occupation Regimes. Yet the picture is not all rosy. The government has been criticized for actions and inactions deemed insensitive to Jews, including the failure to prosecute Nazi criminals and the honoring of some who took action against Jews during the Holocaust. “I wanted to send the message,” she said, “that we Jews are part of a multicultural Lithuania and we are proud to be Litvaks,” the traditional term for Lithuanian Jews. What does the future hold for Jews in Lithuania? Will young people raise their families here? Belaite and Pavinskaite say they plan to remain in their native country. Pavinskaite makes frequent visits to Israel to see her grandparents, who made aliyah in 1991, but she has no plans to emigrate. “It is good to live here,” she said. Kukliansky hopes that young Jewish women like Belaite and Pavinskaite will, indeed, make their lives in Lithuania and will continue to be active leaders in the community. “Lithuania is quite welcoming today for Jews,” she said, “despite what happened in the war. We have all the conditions necessary to develop the Jewish community.” Kukliansky believes Lithuania’s Jewish community will survive and grow. Ellen Cassedy is the author of We Are Here: Memories of the Lithuanian Holocaust (University of Nebraska Press). Her website is ellencassedy.com. We just returned from fabulous trip to Vilnius. We did many of these things with a wonderful tour guide but I would have loved to have seen this article before we left. We were also in Mariampole, the birthplace of mystery father-in-law. We tried to findtried to you, Ellen, since we have your book but were told you were out of the country. Yasher Koach on this wonderful article. Should have said “late father-in-law”. Don’t know how the word “mystery”got in my note. Sorry. Boston-born Rabbi Sholom Ber Krinsky and his wife, offers Shabbat davening and meals and provides other programs. My Family is planning a trip to Kaunas, Palanga, Plunge in early December. Would you have any info on a guide we may use. We will only be there from 12/8 to 12/11. If not could you give me info on how to find a guide.